Sharecase 2017 is this Thursday and the Library will have a major presence this year. The Library’s Makers Lab, Academic Information Systems, Learning Technology Group, and Data Science Initiative (DSI) will all be exhibiting and/or presenting. To kickoff the conference our very own University Librarian Chris Shaffer will be delivering the morning keynote! With all of this participation and excitement, the one question you might ask is. . . Launched in 2012, Sharecase is an event hosted by the the Information Technology community of UCSF that focuses on technology and its many applications across campus. According to the Sharecase website it is “. . .a free one-day event showcasing the best of IT at UCSF, [for] all faculty, [students], and staff! It’s a great way to learn about all the new IT services at UCSF as well as see how your UCSF colleagues are using technology in interesting and innovative ways.” The 2017 theme is IT Ecosystem: Success through collaboration – a theme well aligned with the culture of collaboration that we embrace at the Library. The Library’s strong presence at Sharecase is a reflection of our long history of using technology to support access to information and learning at UCSF. We are exited about the collaborative spirit of this event and look forward to taking this beyond Sharecase and into the daily working environment on campus. The Data Science Initiative team will be promoting their programming, data visualization, data management, statistics, and bioinformatics classes and services. UCSF is a large and diverse institution, comprised of faculty, staff and students from a variety of disciplines and locations. The technical support groups on campus are equally diverse. We have brought together a team of experts from UCSF IT, Educational Technology Services, the Learning Tech Group, and the Library Help Desk to answer your technical questions, and to help you understand what makes each support group unique! The Makers Lab interactive demo table will feature a 3D technology, programmable electronics, and arts and craft activities for attendees to make, learn, and do. Prior to 2016 and the implementation of the Educational Technology Ecosystem Project, UCSF had no comprehensive view of our educational technology landscape. Consequently there was no methodology for integrating these technologies into a healthy ecosystem supporting UCSF’s vision and goals for education. By inventorying this complex, distributed set of tools in 2016, we were able to create a visual picture of our ecosystem to use as a starting point for defining strategic priorities and guiding collaborative work on a more rational plan to support the education mission at UCSF. This project generated recommendations in four areas: governance, inventory management, risk management, and data flows and integration. This presentation will highlight several key outcomes from the past year of work, including tools for vetting new systems, multiple collaborations to integrate key systems, and the beginning of a comprehensive governance model to provide guidance as we grow our ecosystem to support the mission. This session will provide an overview of BI tools, discuss collaborative efforts to adopt a BI tool at UCSF, and highlight current use of Qlik and Tableau on campus. The Learning Tech Group will moderate a panel discussion where various UCSF programs will be sharing solutions for producing and sharing video content in an online classroom. The panel will include an Assistant Professor from the Clinical and Translational Science Institute and Academic Coordinators from the School of Pharmacy and Physical Therapy. 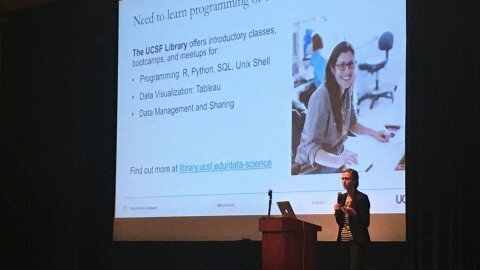 Over the past year, the UCSF Library has been hosting monthly “Programming and Pizza” sessions as part of the Data Science Initiative. These informal workshops bring UCSF researchers, post docs, and faculty together with Library staff and other in house experts to work on projects in Python, R, versioning, archiving, UNIX, SQL, and other core data science technologies. Programming & Pizza sessions have provided the UCSF Library with an opportunity to identify common programming and technology issues experienced by researchers in an increasingly data-driven environment. In this talk, we’ll review the issues we encounter most often, how we work with researchers in these sessions, and how these questions have motivated us to create and offer courses in Python, R, SQL, Unix, and other core data analysis tools. See how we are putting individual authenticated content in front of students in their own learning environment using the LTI standard and AWS Lambda.